Orange-fleshed sweet potatoes can be used for everything from porridge to breads. 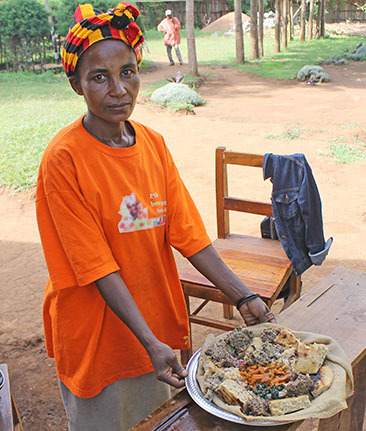 Ethiopian women had the chance to taste new recipes using orange-fleshed sweet potatoes. Malnutrition is far too common in Ethiopia, where the growth of four out of every 10 children younger than 5 is stunted, and one in 10 are severely underweight. The good news is the country has made significant progress, cutting child mortality by more than half since 2000. Yet more needs to be done for children’s health. One of the answers to ensuring healthy mothers and children is the sweet potato—the same orange vegetable many of us make for Thanksgiving dinner. A partnership between the University of Wisconsin-Madison, Hawassa University and the International Potato Center (CIP) is introducing disease-resistant orange-fleshed sweet potato vines, showing communities in two regions of Ethiopia how to grow them and hosting cooking demonstrations to showcase how they can be used. Mothers who eat the vitamin-rich sweet potatoes report they have an easier time giving birth and recover more quickly. They can feed their children three times a day, the women say, and orange-fleshed sweet potatoes make their children happier than other vegetables. Children are healthier, more alert, more active and doing better in school. Farmers sell the roots, and women sell bread made from sweet potato flour, giving families new income. The key to the orange-fleshed sweet potato’s effectiveness against malnutrition is Vitamin A— a nutrient important for eye health, a strong immune system and children’s growth and development. It’s abundant in orange-fleshed sweet potatoes. Traditionally, Ethiopians are most familiar with white sweet potatoes that are grown in the southern region and prepared differently and lack the nutritional value of their orange cousins. 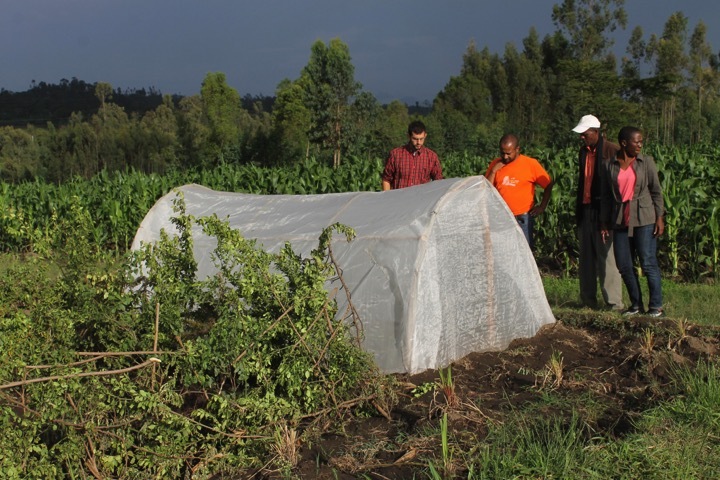 This project builds upon CIP’s previous agronomy work to bring more root crop varieties to Ethiopian farmers. Activities include everything from providing disease-free orange-fleshed sweet potato vines to creating and sharing recipes that use sweet potato leaves and roots in flatbreads, porridge, stews and cookies. 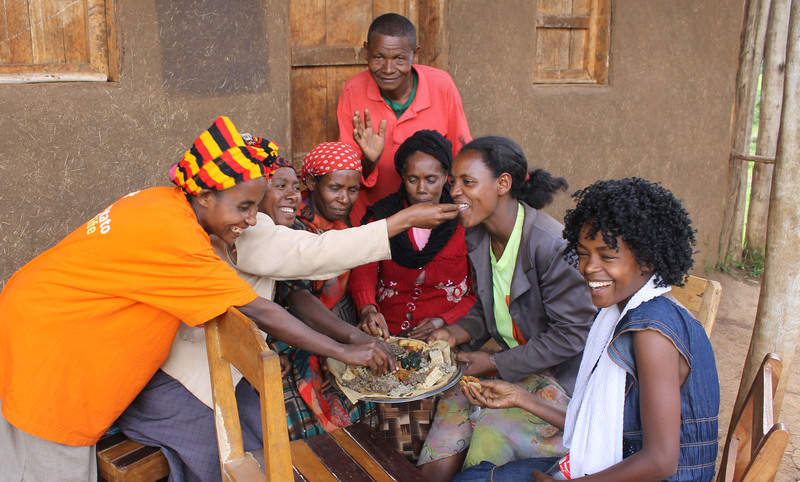 For Henok Kurabachew, an associate professor of plant pathology and director of Hawassa University’s Center for Food, Nutrition, and Technology, sweet potatoes are an important way agriculture can improve Ethiopian families’ health well into the future. He visited UW-Madison in August to expand collaboration between the universities, create new partnerships to improve nutrition and health for small farmers and rural communities, and improve agriculture-nutrition-health programs in both countries. 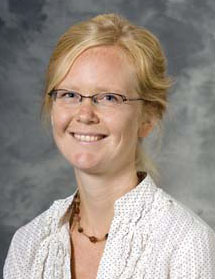 His visit was made possible through a Visiting Scholars Award from the Global Health Institute. The United Nations estimates one in nine people globally do not have enough food to lead healthy lives, and almost all of them live in developing countries. Malnutrition costs the world $4.5 billion a year, Kurabachew says. Children go to school on empty stomachs. Hungry workers cannot be productive. In 2008, the government of Ethiopia established Africa’s first National Nutrition Program, backed by nine ministries, to combat malnutrition and ensure people have enough to eat. “You can’t solve malnutrition by providing some kind of capsule,” Kurabachew says. The causes of malnutrition cross many aspects of life, and the solution must come from many sectors. By looking to agriculture, the sweet potato project empowers farmers – both men and women – to improve their families’ health and economic well-being. It also encourages shared policy-setting across the sectors of agriculture, health and education. Row covers improved the health of sweet potato vines that will be used to produce seed. In southern Ethiopia, Getahun, a farmer leader, showed Riley Balikian, a UW-Madison graduate student in the Nelson Institute for Environmental Studies, and Urban and Regional Planning, his 25-by-25 foot plot for orange-flesh sweet potatoes and the briar fence he’d erected to protect them. Getahun is a model farmer, tasked by the local government-run Farmer Training Center to introduce new crops and management techniques. CIP helped provide the design and materials for a net tunnel, so Getahun could determine whether it was best for the crop. He shares his knowledge and extra vines he grows to encourage others to grow the orange sweet potatoes. Not every experience was successful, but people trusted the community members CIP trained to share the orange-fleshed sweet potato information. In one southern Ethiopian community, a woman successfully grew enough to sell roots worth 2,000 birr (about $100) and leaves worth 1,500 birr during the pilot project – a significant income for a farm that may not otherwise have off-farm income. Previous post: What Global Goal will you champion?